This article will go over how to print up the label sheets for your menu items. This report will not produce the label sheets if you have not created your formulas. You will want to purchase 5160 label sheets to have the report printed on. The labels on this report are used to label the menu items for the order. So you might send your menu items out in aluminum pans. Instead of the client having to open each pan to see what is in the pan the label on the cover of the pan will let the client know what menu item it is. 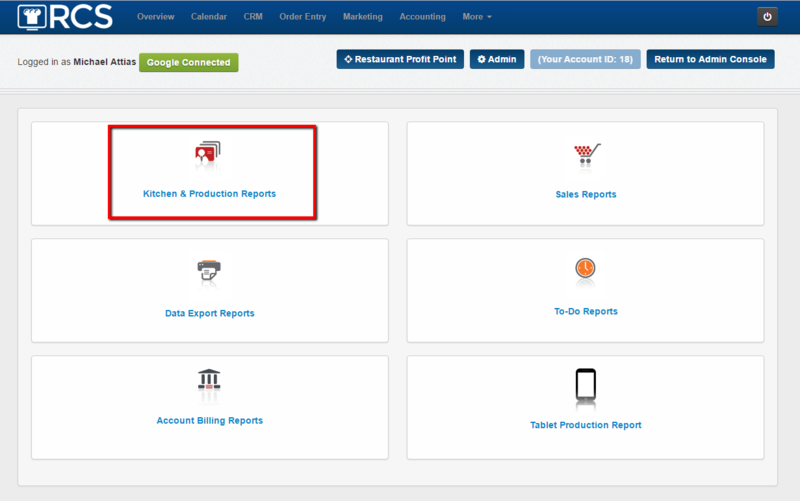 4 - The next page that will appear will allow you to make Choices for your report. B - Next you can choose how you want your labels to Sort on the report. The default is Serve Time. C - By default All Stations will appear in the report. If you only need one station to appear you can click that station. 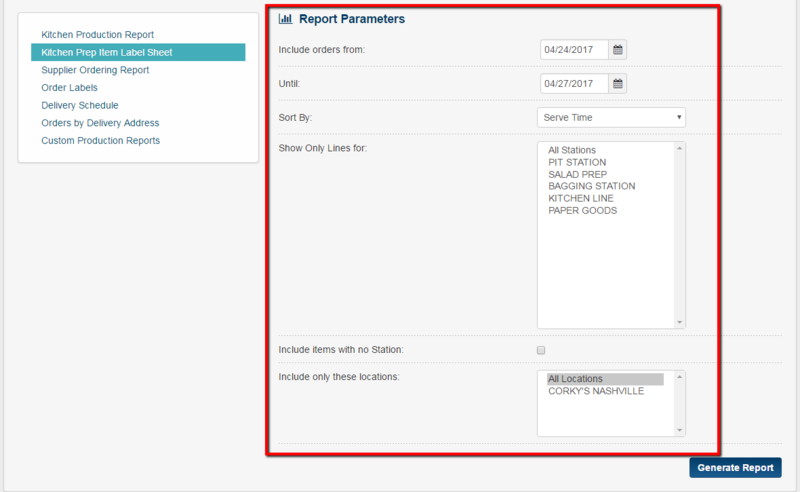 D - If a menu item is not assigned to a station you can have that menu item Not Appear on the report by checking this box. 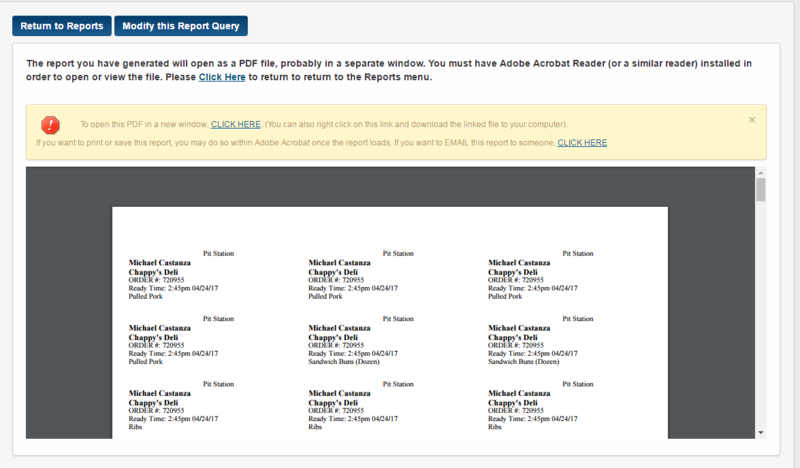 6 - Click on the Generate Report tab once you have made your selections. 7 - Next your report will appear. 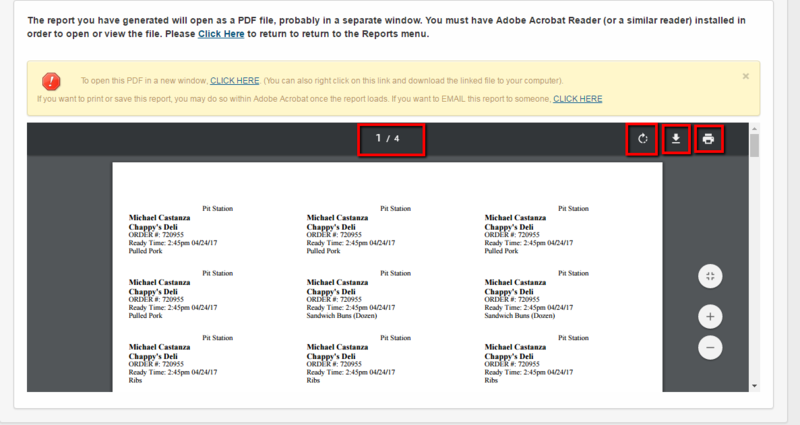 8 - At the top you can Return to the Reports page or you can Modify the report you just pulled up. 9 - Please note the report will pull up as a PDF file to be printed. 10 - Note you will see at the top how many label sheets you will need to print the report - You can Refresh your report with Circle Arrow icon - You can Download the report as a PDF with the Download icon - You can Print the report with the Print icon. You have now learned how to print your labels for your orders.